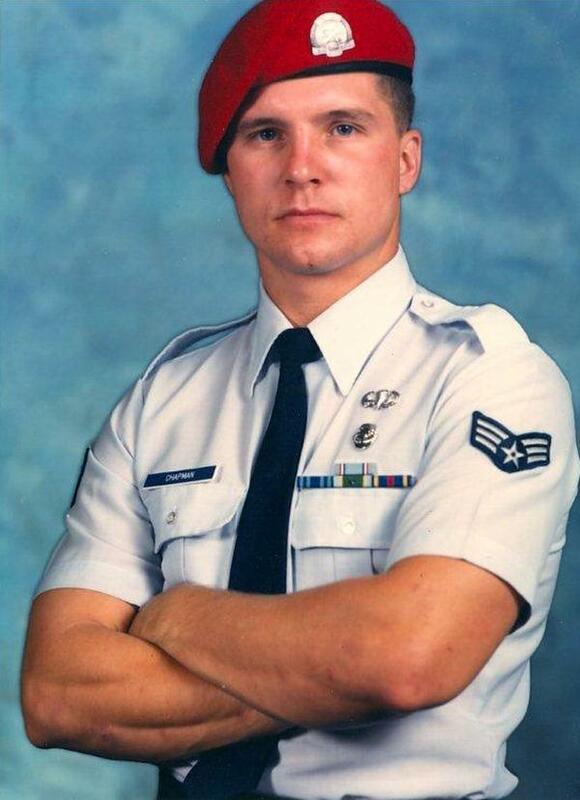 Chapman, shown at the rank of senior airman, died in Afghanistan in 2002 during an operation to rescue a wounded Navy SEAL. Valerie Nessel (second from left), accompanied by family members, accepts the Medal of Honor from President Trump awarded posthumously to her husband, Air Force Tech. Sgt. John A. Chapman. "Mayday. Mayday. Mayday. Any Grim. Any Nail. This is Mako Three Zero." The distress call came in the dead of a March night in 2002. A U.S. commando unit — Mako Three Zero — was in trouble. Al-Qaida fighters had ambushed it on a snowy peak called Takur Ghar in eastern Afghanistan. Grim. Nail. Those were the call signs of the AC-130 gunships, fearsome aircraft with cameras, sensors and big guns. Grim 32 answered and started flying toward Takur Ghar to provide help. Air Force Chief Master Sgt. Rob Harrison was a crew member. "We flew as fast as we could to their location," he said. When they arrived some 15 minutes later, they saw a downed helicopter miles from the mountaintop where commandos were trying to set up a reconnaissance post. And they learned the worst. One of the commandos, Petty Officer 1st Class Neil Roberts, had fallen off the ramp of the helicopter after it was riddled with fire. He was on top of Takur Ghar. The AC-130 was able to see Roberts leaning against a large rock. His blinking transponder strobe was visible on their infrared cameras. And the crew could see he was being surrounded by al-Qaida fighters. Soon his strobe flicked off. And they couldn't help. Al-Qaida was right next to him. The military calls it "danger close." "If you fire at that point," says Harrison, "you risk losing a friendly." The commando unit quickly reassembled, hopped into another helicopter, then flew back to get Roberts. Harrison could see them spill out of the helicopter and head toward the al-Qaida bunkers. They looked like ghostly figures against the cold snow. Out in front was Air Force Tech. Sgt. John Chapman. "He takes point and he goes straight toward the bunker and eliminates bunker No. 1," says Harrison. Killing two fighters, before turning to another bunker. But there's a problem in the skies above them. The AC-130 can't communicate with the commando team. "They're calling, 'Hey Grim this is Mako,' " recalls Harrison. "But unfortunately as we go to respond they don't hear us. We can hear them but they don't hear us." And since the gunship can't communicate with the ground unit, it can't fire. For the time being, the commando unit Mako Three Zero is on its own. Chapman — whose specialty was calling in airstrikes — moves away from the cover of a large rock and a tree and into the open. He takes out the machine gunner in that second bunker, but is wounded and falls into the snow. Harrison remembers seeing bullets and explosions from rocket-propelled grenades flash on his computer screen. It was close-quarters combat. One officer described it as a "firefight in a phone booth." "The team has taken multiple casualties," Harrison says. "The decision is made to break contact." Break contact. Start heading toward a safer place. The head of the commando unit, Master Chief Petty Officer Brit Slabinski, slides over toward the wounded Chapman in the snow. Slablinski talked about that moment last spring during an interview with Fox News, when he himself was awarded a Medal of Honor for his actions that day. "I crawled over to John. Crawled over on top of John looking for some sign of life from him and I didn't get any," remembered Slabinksi, "no movement, no sigh or anything." So, convinced Chapman was dead, Slabinski knew his team had to move away from enemy fire to survive. There were multiple casualties. The commandos popped smoke grenades to conceal their movements. Slabinski led them, slipping and sliding, down the mountain. But Chapman wasn't dead. He was unconscious. He woke up and started firing again, trying to prevent the al-Qaida fighters from destroying a rescue helicopter. His body was recovered later that day outside the bunker. Finally, Mako Three Zero made contact with the gunship. The surviving commandos asked for the gunship to fire at the al-Qaida fighters, to cover their rescue. Then something strange happened, remembered Harrison. "We saw another strobe that came active on top of the hill," he said. A U.S. military strobe. But the man they were trying to rescue — Roberts — his strobe had been disabled by al-Qaida. What was this one? The airship fired rounds of massive 105 mm shells but kept clear of the area near the strobe signal. Harrison said the air crew was confused, and it was only later after an exhaustive investigation — with new technology and enhanced videos — completed by the Air Force in 2016 that the story was complete. "We didn't have the technology to put all the different pieces together, so these were just theories. There were many who had this theory three months after the initial investigation," says Chief Master Sgt. Greg Smith, with the Air Force Special Operations Command. Chapman was initially awarded the Air Force Cross, the second-highest award for valor. Now with this new information, the medal was upgraded to the Medal of Honor. He is the first airman to receive the medal since the Vietnam War. Harrison often thinks of that mission and says he gets "goose bumps" when he considers the bravery of those commandos. And he says Chapman's medal is especially important to the Air Force, whose commandos work on the ground with Navy SEALs and Green Berets, calling in airstrikes or setting up airfields. Others — known as Air Force pararescuemen, or PJs — risk their lives to rescue downed pilots. "When the average audience member thinks of the Air Force, they don't think of a battlefield airman," he says. "But the type of valor that is demonstrated by Sgt. Chapman is just one of those things for the history books." 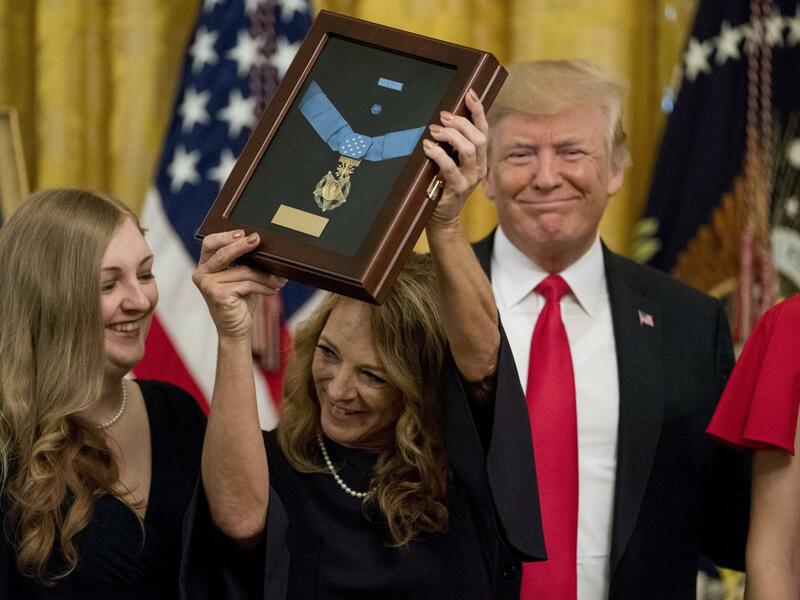 This afternoon, President Trump will posthumously award the nation's highest decoration for valor, the Medal of Honor, to Air Force Technical Sergeant John Chapman. Chapman was killed in 2002 on a mountain in eastern Afghanistan after he repeatedly risked his life to protect his comrades. He's the first airman to receive the medal since the Vietnam War. NPR's Tom Bowman has his story. TOM BOWMAN, BYLINE: Air Force Chief Master Sergeant Rob Harrison was a crew member aboard an AC-130 gunship in the skies above Afghanistan when the distress call crackled over the radio in the middle of a March night. ROB HARRISON: Mayday, mayday, mayday. Any grim. Any nail. This is Mako 30. BOWMAN: Mako 30 - that was a U.S. commando team on the ground fighting to survive on a snowy peak. And any grim, any nail - those were the call signs of the lumbering gunships, complete with cameras, sensors, massive guns. HARRISON: We flew as fast as we could to their location. BOWMAN: They arrived some 15 minutes later. They could see a helicopter had crash-landed. Mako 30 had tried to set up an observation post on the mountain, but the blistering fire from al-Qaida fighters severely damaged the helicopter and caused one commando, Petty Officer First Class Neil Roberts, to fall from the helicopter's ramp into the snow. The gunship's infrared cameras showed grainy, ghostly figures against the cold snow in a single, flashing strobe, the kind Americans in combat wear on their fatigues. HARRISON: And we saw Petty Officer Roberts. He was on top of the ridge. He had an infrared strobe going off, which is how we could tell it was him. BOWMAN: Soon the computer screen showed figures surging toward Roberts, and his strobe was switched off. He was in the hands of al-Qaida fighters. The gunship couldn't fire because of what the military calls danger close. HARRISON: If you fire at that point, you risk hurting a friendly. BOWMAN: What happened next was a mission to rescue Roberts in an effort that would lead to a pair of Medals of Honor and leave seven Americans dead. Sergeant Chapman, a combat controller who calls in airstrikes, and the other commandos quickly reassembled and hopped into another Chinook helicopter. HARRISON: They flew directly back into the hornet's nest. BOWMAN: The helicopter lumbered toward the summit and the commandos spilled out, but the gunship couldn't make radio contact with the commando team Mako 30 so they couldn't fire in support. And they watched on their computer screens as Chapman and the other commandos surged toward al-Qaida bunkers. Chapman was out in front. BOWMAN: ...Killing two fighters in a bunker that was little more than a hole next to a tree. Off to Chapman's side, a machine gun was aimed toward Mako 30. Chapman left the cover of rocks and trees and ran toward a second bunker. Harrison could see tracer rounds and explosions light up on the warship's computer screens. HARRISON: There was an absolute melee of fires going back and forth between friendly and enemy. BOWMAN: Chapman was hit. The leader of the group, Master Chief Petty Officer Britt Slabinksi, slid toward him in the snow. He described what happened in an interview on Fox News back in May when he was awarded a Medal of Honor. BRITT SLABINSKI: I crawl over to John, crawl over the top of John, looking for some sign of life from him, and I didn't get any. No movement, no sound or anything from him. BOWMAN: Convinced Chapman was dead, Slabinksi knew his team had to move away from enemy fire to survive. There were multiple casualties. They popped smoke grenades to conceal their movements, and the commandos slipped and slid down the mountain. Finally, Mako 30 made contact with a gunship. BOWMAN: The commandos ask for the gunship to fire at the al-Qaida fighters to cover their rescue. Then something strange happened, remembered Chief Master Sergeant Harrison. HARRISON: We saw another strobe that came active on top of the ridge. BOWMAN: A U.S. military strobe. But the man they were trying to rescue, Petty Officer Roberts, his strobe had been disabled by al-Qaida. What was this one? The airship fired rounds of massive 105mm shells but kept clear of the area near this strobe signal. Harrison said the air crew was confused. It was only later, after an exhaustive investigation with new technology, completed by the Air Force in 2016, that the story was complete. Here's Chief Master Sergeant Greg Smith with the Air Force Special Operations Command. GREG SMITH: As you enhance some of the video and we're able to follow the actual movement and then compare that to other video footage and where John was found on the mountain, there's no other plausible explanation. Where he was found absolutely correlates with movement that was seen later in the tape. BOWMAN: What they learned is that Sergeant Chapman clearly regained consciousness and fought al-Qaida until the end, preventing the rescue helicopter from being downed. His body was found just outside Bunker One. He was awarded the Air Force Cross, the second-highest award for combat valor. All these years later, Harrison can't shake that day. HARRISON: I still get goosebumps. We're literally surrounded by heroes, and the type of valor that is demonstrated by Sergeant Chapman is just one of those things for the history books. BOWMAN: And today at the White House, Sergeant Chapman's widow, Valerie, will accept the Medal of Honor for her husband. Tom Bowman, NPR News, Washington. Transcript provided by NPR, Copyright NPR.